Do your children have parents or competitors? Quite common in young children. We help by giving names to the desires and emotions underlying their “hate yous” and by offering ways to cope. Questions, by nature, put us on alert. “Why?” piques us to respond. Thus, why?-why?-why? can quickly become exhausting. 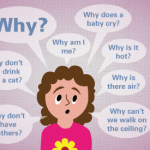 But, your child’s “whys” are a good developmental sign. Here’s how to get relief without discouraging your child.